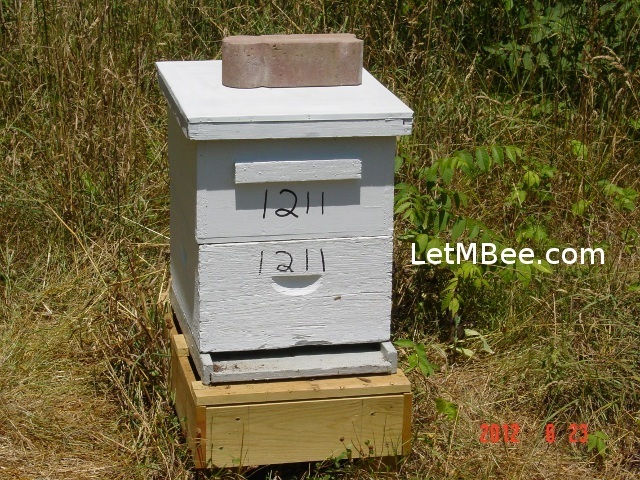 1211 – This hive was painted by the hive host. White is going to take some getting used to. Previously I had written about Trap #25 having no eggs or larvae in it (see Queenless Trap). I had close to a 100 mile round trip in trap retrieval, that queen needed to be there. Anita from Beverly Bees optimistically left a comment that perhaps it was a virgin swarm. I was hoping for the best since hiving them on 6/15. Last Saturday (6/23) I returned to see what was going on. Pollen was entering the hive so I began to get excited. There are no in-hive pics, but rest assured, there was brood in “them there combs”. The hive was labeled 1211 – the 11th hive added in 2012. This is FM01. Can’t add any more supers until I cut some limbs. 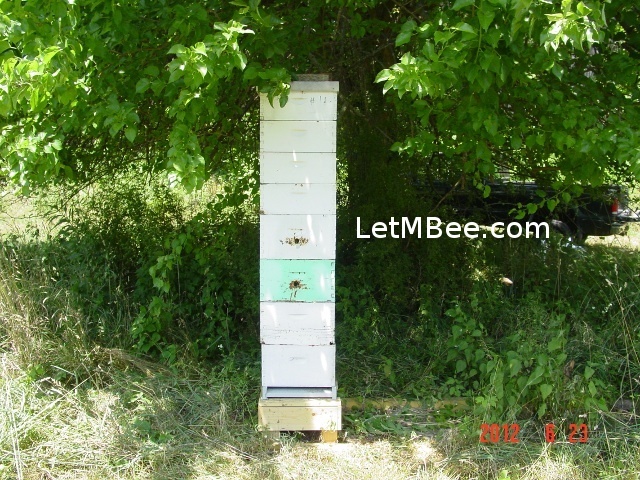 The site where 1211 is located has three other hives that I manage for a friend. I have mentioned him in previous posts. His hives first opened my eyes to the use of three deeps. Last year hive FM01 amazed me with the size of their workforce as well as their honey production. They overwintered with no added protection from the weather, no mouse guard, and no feeding. The gentleman that owns this property wants the bees left alone as much as possible which is right up my alley. I did remove the top and inner cover from FM01 to see if the top super was full. It was so another medium with drawn comb was added. This group is providing a good stress test for the new hive stands. They seem to be handling the load well. I am not sure what kind of nectar they are bringing in. White clover was hanging on for a while, but is disappearing due to lack of rain. All of the hives visited on 6/23 were busy and working showing considerable progress in honey production since they were last visited. Have you had any experience with queens taking a while to get started laying eggs? Are your bees finding work? Leave a comment. This entry was posted in Hive Reports, Swarm Trapping, Uncategorized and tagged bee, beekeeping, Indiana beekepeing, Jason Bruns. Bookmark the permalink. Wow, FM01 is an impressive hive!! How many entrances does it have? Did you drill holes in the boxes? Thanks for the mention. I’m glad this hive is queen right after all. On FM01 there are 3 entrances. I didn’t drill the holes in those boxes. In most of my established hives I have. For whatever reason a lot of the beeks around here put a hole in the center of deep boxes. Don’t know who started it, but a lot of the used equipment I purchased three years ago already had them in there. Sorry to hear you are still dealing with computer stuff. I can relate; it is a drag. And yes! Actually, the queen we have in Hive 2 took a long time to start laying which is not the normal pattern for this hive which we caught as a swarm in 2009. They usually build up quickly and have very busy flight paths in March. The first inspection of this year yielded only a handful of bees, and we were alarmed to see such a small population in a usually thriving hive. We then went through a cold and rainy spell, so I wrapped the hive in a fleece blanket to keep the bees and any larvae warm. I struggled with this–my enabling of perhaps a weakened hive, but since we had such a history with this hive, I couldn’t bear to lose them like we did our beloved Hive 1. Their population started to slowly build. I checked on them every day and noted slight increases as the days passed. Perhaps a month later, I noticed the usual traffic patterns in front of this hive. They are still doing well and are very busy. I haven’t figured out what the delay was, but no matter, I am happy that this hive is doing well, the queen is viable, and the frames are full of honey! Mil the doting mother!! 🙂 I know how easy it is to get attached to a hive that really seems to stand out. Hive 1005 – “The Gerald Hive” is such a hive. Also their swarm from last year 1101. I am looking into wrapping my hives with something this winter, I just don’t know what yet. It was hard for me to believe seeing those eggs and larvae in that box (1211). I thought for certain it was all over them. I was so close to shaking them out the day I hived them. WHAT A STUPID THING TO HAVE ALMOST DONE!!! Making me think that my RULE #1 – There should be no rash decisions in beekeeping. Another thing I am noticing is that several of the hives I caught last year in July and August are POURING IT ON this year. They started out VERY SLOW, many only occupying 1 deep over last winter, but this year they are booming. Swarm in July not worth a fly, MY EYE!!! I think slow build up has something to do with initial size and store a colony has, apparently bees know how much stores they have and act accordingly, and they can only take care of as much brood as the current population can cover, so it makes sense that a colony that winters smaller would grow slower then a huge colony. My hive #1 was super small last winter seems fine now except that they have a chalk brood problem and no stores, lots of bees though, I found and pinched the queen last week so they would be forced to make a new one, hopefully this will improve their genetics, interesting experiment at the very least. I am inclined to believe that there is a definite genetic component to swarm size. The contents of Trap 09 came from the same place I caught a fairly small group of bees from last year. You will have to let me know how that works out for you. I have been talking to a guy from northern Indiana that is focusing on improvement of his stocks via what I would call “the drone route”. He has his strong colonies produce honey for him and he splits his weaker ones forcing at least half of them to make new queens. From what I gather he believes that his stocks are improving using this method. I will be experimenting with it at least on a small scale next year. He focuses on locally sourced stocks and doesn’t purchase bees. Perhaps we have been over emphasizing the importance of queens and not looking at drone genetics enough. Does it snow where you are? What were you thinking of wrapping the bee hives with? The fleece presented a problem when it rained and then I put plastic over it. The made me nervous because I would like the wood to breathe. I do know that hives can and must requeen from time to time unexpectedly. One of my greatest turn-around hives is 1001. Last year I almost wrote them off, but they requeened sometime last summer. This year it is the best hive I have at that hive site. I have a local friend that has had issues with SEVERAL hives going queenless. I don’t know. I guess that is something I can ponder today. I’m curious whether this hive swarmed as nectar tapered off at the dearth (assuming you have one). Like you I don’t sweat it when good hives swarm and add to the local gene pool but at times I may wish to avoid it. (One fellow running three deeps says he seldom has swarms if the supers are on in earl April. He has a continual flow through summer and no dearth most years. I catch swarms all summer long from mid April until the end of July. I have seen pictures of swarms as late as the last week in September here. That swarm came from a place where I have caught a lot of swarms. There are many feral hives in that area. My bees have not swarmed much the last two years with the exception of one hive site that I didn’t get to until the first week of May this year. They ALL swarmed. They were all in 3 deeps and they swarmed like champs! What I normally do to keep them from swarming is put on 4 – 6 supers late March or early April. My biggest reason for doing three deeps is that I always hated seeing my good colonies filling up the brood boxes late in the summer when they are at full population. They would hang outside packed against the bottoms of the frames of the lower box. On hot humid evenings because they didn’t seem like they had enough room to get in. Since changing to 3 deeps and top entrances I don’t see that anymore. I am sure that some of my hives swarm every year. I have 8 different places I keep them so if they are swarming I am missing it. I really don’t know what makes those later swarms go. In the early part of the Spring I can predict when traps are going to fill up based on rain heat and humidity. After the third week of June that pattern changes. Thanks for reading.